I’ve always been a huge fan of Pac-Man, but was generally disappointed by the clones and conversions I’d played over the years. My complaints included dumb ghosts and clumsy controls, but it was often just down to a lack of attention to detail, which spoiled the overall feel. Having just finish Uni (July ‘93), and with some time on my hands, I had a go at writing my own (as you do). Version 1.1, last updated 17th January 2004. Graphical and colours close to the original (despite the reduced resolution). Arcade maze layout with the correct number of pills. Different ghost personalities (approximate), with steadily increasing speed and aggression. Speed/position/behaviour in ghost box, with correct leaving order (pink, cyan, orange). Ghosts head for their respective corners until first reverse (7 seconds on cherry). Half-speed ghosts in tunnels, clipped to the maze edge. Power pill flash rate, point value, and durations (matching slow arcade difficulty). 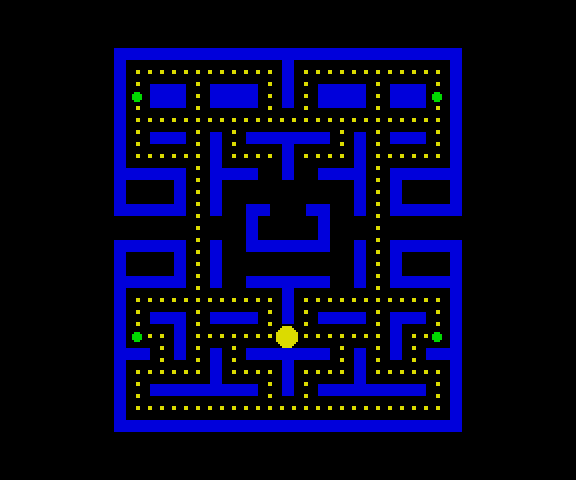 Fruit displayed twice per maze with correct order and point values. Escape routes above starting position and ghost box. Sound effects and start/intermission music. Intermission sequences after strawberry, 2nd apple, etc. Ghost eyes indicating new direction just before they turn. Ghosts returning to their respective corners after alternate reverses (scatter mode). Ghost/Pac-Man sense adjustments (e.g. pink aims ahead and left a bit). Cruise Elroy, for increased speed and aggression when fewer pills left (powers of 2). This was the first mock-up, created entirely by hand in the Flash graphics package. 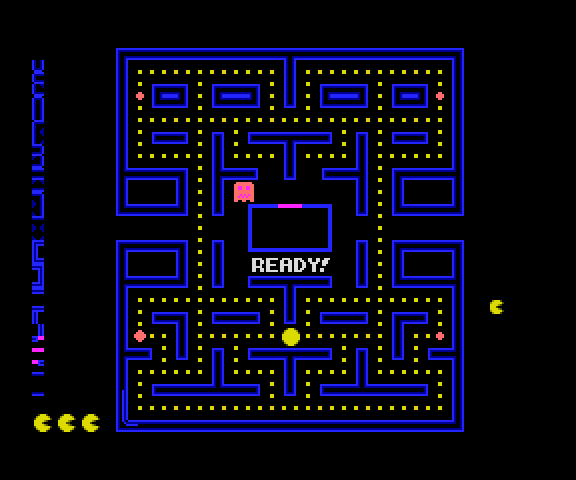 The maze layout was taken from Acornsoft's Snapper, and completely filled the SAM screen. Pac-Man himself was given a 3D look, just for fun. If you look closely you'll see some issues with pill spacing, mainly around the central column. I found The Video Master's Guide To Pac-Man at a jumble sale a few years before I started. 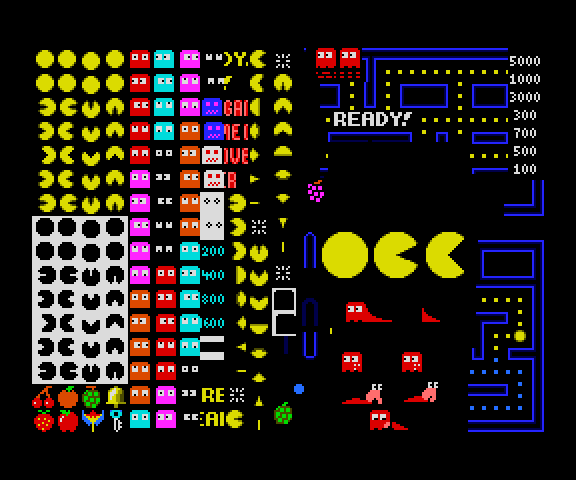 It contains general Pac-Man information, including diagrams of the maze layout. There was enough detail for me to break the maze up into the building blocks used to create it. I knocked up a BASIC program to generate a maze image from the data I'd extracted - this image shows the result. Using 6-pixel blocks filled the height of the SAM display exactly — perfect! The maze also had the correct number of pills and no problems with spacing. Happy with the maze layout, next up was to work out the building blocks needed to create the pipe-effect maze like the arcade version. 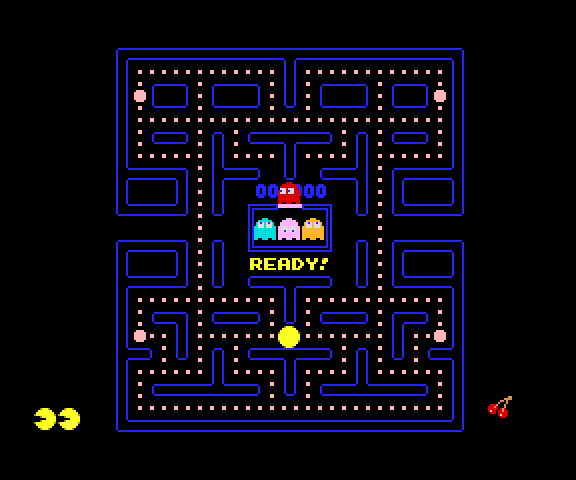 Sticking with the traditional design, Pac-Man was transformed into a flat disc. The sprite is anti-aliased to try and make up for the low resolution — it looks more obvious on a modern monitor, but was nice and smooth viewed on my 14" TV. The colour of the pills and text were still unknown, since the book wasn't colour, so I guessed for now. The maze was given a two-tone blue for the glow effect I'd remembered it having. At this point I was lucky enough to find a real Pac-Man machine, which meant I could check colours, ghost behaviour, etc. to adapt to my own version. Remember, this was long before MAME existed! Learning patterns from the book, I was able to play to around the 7th key board. This was far enough to see all the fruit graphics and intermission sequences. I also got a feel for the different ghost personalities, and other general features of gameplay. This image shows the 172 sprites used in version 1.0. 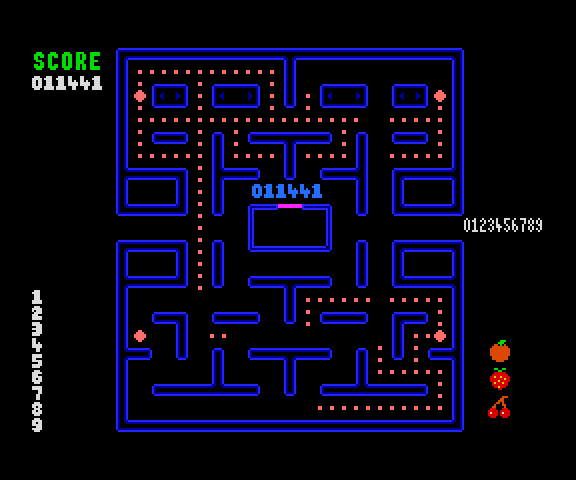 The original machine has the score above the maze, and the lives counter and level fruit below it. Unfortunately, there is no room around the maze in the SAM version. After some experimentation, the score was positioned above the ghost box. The sprites cover the score as they pass over it, so as not to get in the way. Fruit was stacked vertically in the bottom right, with the lives shown in the bottom left, both close to the original positions. 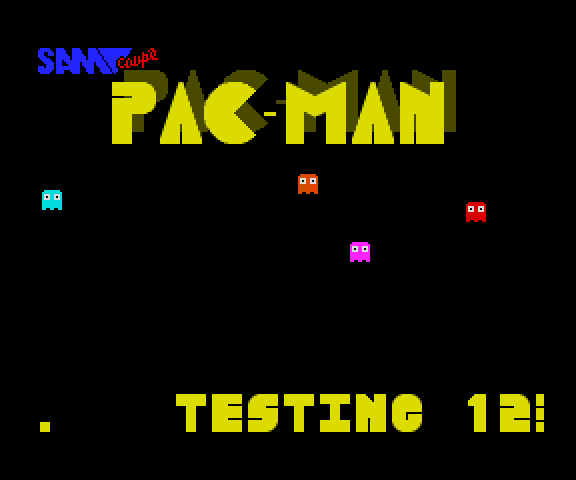 I decided against a standard Pac-Man attract screen, going for a more traditional game menu screen, complete with scrolling message. 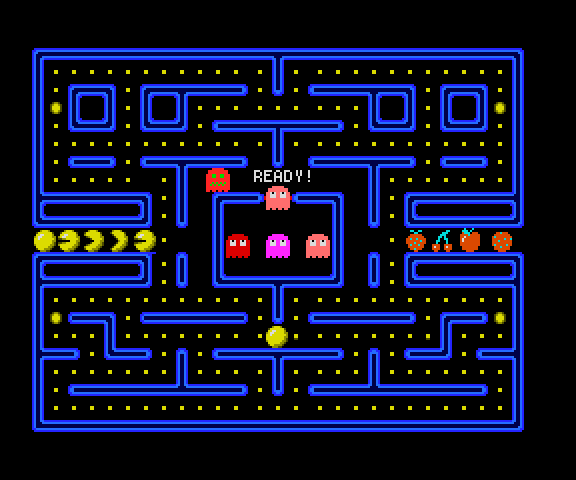 The main Pac-Man logo was created in the style of the characters found on some old Pac-Man stickers. 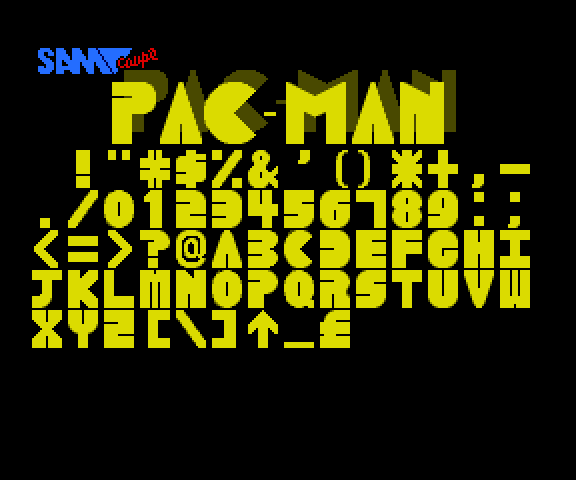 The rest of the font was created by hand, trying to match the general style of the existing characters. The title screen was never completed, though it stands a better chance of being done now I have the source code in a workable format. I've been saying that for years, so don't hold your breath.